Just over a year ago Spark (the Largest Telecommunications Company in NZ) announced they had won the rights for the Rugby World Cup. Yes the four yearly holy grail the All Blacks have owned since 2011 – and choked in the two decades beforehand. Welcome to 2019 and the age of online TV and high speed broadband. Well not utilised by everyone but for most of us now. Netflix has certainly helped with it now being mainstream in many homes. 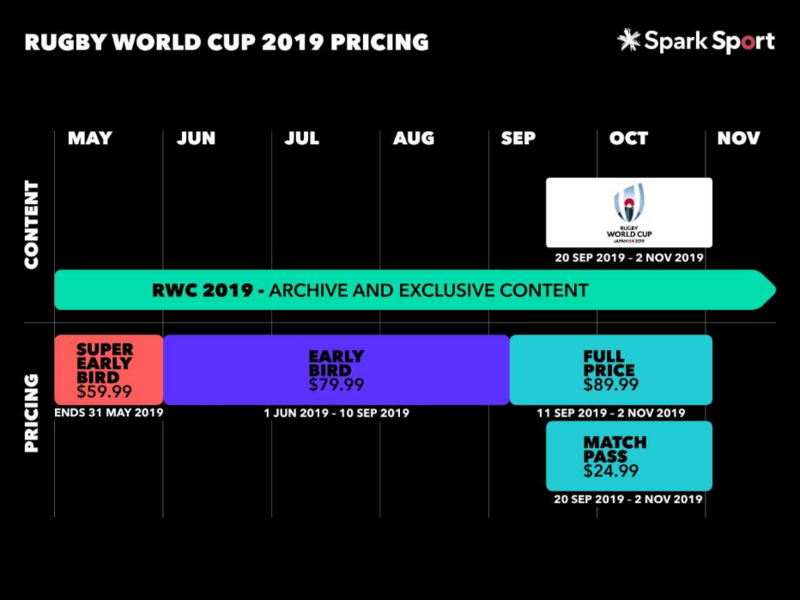 Yes that’s how the RWC will work more or less. For English Premier League fans it’s been a mainstream (excuse the pun) as to how to watch for a few years now if you want to see Tottenham thrash Arsenal. Sky have lost thousands of customers over the past two years as people decide Netflix and TVNZ On Demand for example fits their needs. So what’s the issue now the All Blacks are online ? Yes there will be those who live in rural areas who may struggle to get a decent internet connection however those in that boat probably don’t have the pleasure of Netflix or any other streaming service with any kind of watchable quality. TVNZ will have the All Black games delayed so all is not lost. Not the same and watching live however you can’t have all things for all people can you. Spark say you need a minimum of 6Mb/s to stream their service. Go to https://www.speedtest.net/ and see what you can get. Sure streaming will not suit everyone however watching a silly cat video on You Tube is basically the same experience – called streaming a video via the internet. Today as consumers we do not seem to have problems uploading videos to Facebook or selfies at a rugby game so why all the angst in having to watching the game online ? And What could possibly go wrong ? Spark are confident that everyone will be fine however there is always Murphy’s Law. TVNZ have been announced as back up if all else fails during a crucial Beaudan Barrett kick at goal. Spark have had a year to get this right via winning streaming rights to Formula One and some other sports and have another 5 months to get it perfected so odds are they will. Sky have not always been perfect – anyone remember this ? Get on board at $60.00 – seriously what is there to lose at that price ? And another suggestion – don’t wait unto, the day of the first match. Test your streaming and your set up. Prepare properly for the tournament. The All Blacks will be so what not their fans ?